Ever wonder how to dry roast cashews with a wok and tastes exactly like what you get in a tin or packet ready roasted from the store? The secret ingredient is salt. Yes salt and lots of it too. I learnt this from my mum many years ago and now passing this recipe to anyone who is interested. This method of dry roasting is far better than any oven roasting or deep frying. Before mum knew how to use salt, preparing cashew involved blanching the nuts first, drying then deep frying and the result IMO wasn't that brilliant for all that work. Why salt? Salt is a very good heat transfer medium and evenly roasting the nuts to perfection while slightly salting them too. I promised the nuts roasted this way will not be too salty. The most important thing to remember is not to wash or dampen them before dry roasting or they will be encrusted with salt leading you cursing at me for inedible nuts. Now what salt and how much is needed? The salt has to be free flowing cheap cooking salt, not fancy salt, rock salt or unrefined sea salt. For around 500g of raw cashews you need about 700 - 750g of salt. Now how to do it. It's simple really all you need is tip the salt into a wok or large saute pan (must be spotlessly clean and no grease), heat and stir at medium heat for about 2 minutes then turn the heat down to medium low then tip in the nuts. Keep stirring and the salt will become very hot. The nuts will be perfectly browned (medium brown) in about 15 - 18 minutes. Then tip the lot into a colander with bowl underneath like picture below. Shake or stir with a large spoon, every single loose grain of salt will be removed. *This salt can be re-used again and again till it becomes too dirty or smell rancid (from the residue nut bits) if kept for too long. ** If you fancy flavoured nuts you can add chopped rosemary or some five spice powder to the salt. The salt may not be that great for reuse, but hey salt is dirt cheap anyway. Ooh this is a great tip! I have not come across this method but will try it next time I roast some nuts! I'll definitely send this on to my mum - she's a deep-fryer too. I tried this.Very easy but found the nuts a tad too salty.Should i try reducing the amount of salt used for roasting next time? Otherwise it's good as no oil is used. I never find it saltier than shop bought roasted and salted cashews. Did you use free flowing salt like table salt, wet or unprocessed sea salt is not suitable for this. 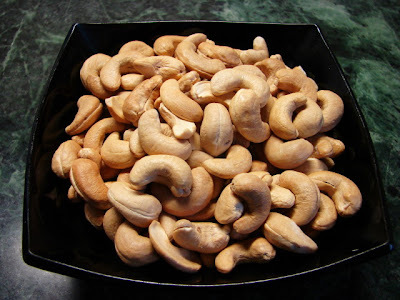 Did you wet or damp the cashews before dry roasting with salt? Did you vigorously shake off all the salt granules using a sieve? You can reduce the salt but that will reduce the heat (salt absorb the heat and roast the cashews), also I don't think it will make any difference to the saltiness. 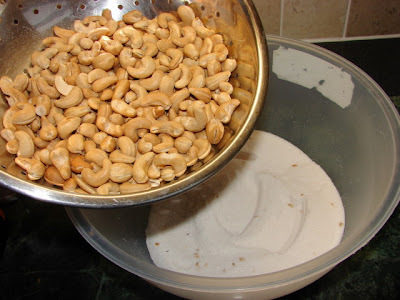 If you really find it salty, what you can do is after sieving out the salt, rub the cashews with a clean dry towel, that will rub off some of the powdery salt granules adhering to the surface of the cashew. Tried this again but this time I dried the salt in the wok before tipping in the cashews.Came out good this time.Think the salt we buy here tend to be a little wet because of the humidity hence important to dry it before pouring in the cashews so that the salt granules do not cling to them.Thanks for this great way of roasting cashews. I used to fry cashew nuts with coarse sea salt long long ago and they turned out just fine.